Five Guys, Dunkin’ Donuts, Subway, Golden Corral….and the list goes on. I love food! So when I had a thought about how to relate leadership to food, I simply had to go there. Now, similar to our need for a balanced diet regarding our personal health, our effectiveness in leadership also requires balance. Too much of one or two and omitting the rest can lead to malnutrition. Knowledge – Always be reading something on leadership that offers practical advice in your area of leadership. Subscribe and listen to podcasts or buy some audio books. I tend to load up my iPhone with new podcasts to listen to when I’m traveling. Once in a while, read from authors on leadership who don’t share the same approach to leading others as you do. This will challenge and strengthen you. Experience – Everything you have done is a valuable experience to learn from…both successes and failures. One of the greatest tragedies young ministers/leaders make is avoiding conflict. Conflict (good and bad) is a buffet for gaining experience. Embrace it and then learn something from it every time! The more experiences you have and learn from, the better potential you have of becoming an insightful leader. Lastly, learn from others…and mostly from their mistakes. These will hopefully be mistakes you won’t have to make on your own. Application – When we take knowledge and experience and pack them away in the attic, we essentially have an empty house. We must try things, even if some are a little frightening. Start something new. Try a different way of doing something. Ask someone younger than you what they would do and then try it. Spiritual Awareness – This food group gives some ‘crunch’ to the other three. Without this one, Church leaders are no different than your average corporate America department manager. But with it, we have the ability to tap into the most brilliant CEO (God). It is so important that we continually check our growth, decisions, vision, and actions with Him in prayer. Doing this ensures a much better success rate than merely leading on our own. 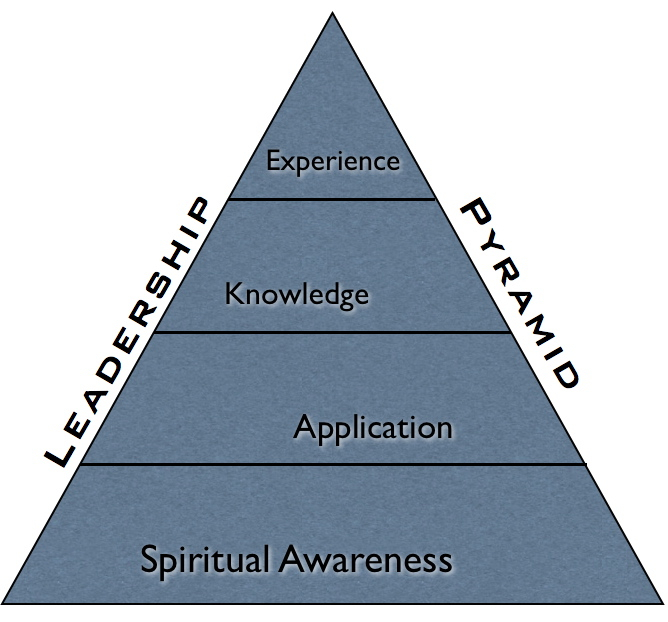 Question: What would you add or edit in this Leadership Pyramid?